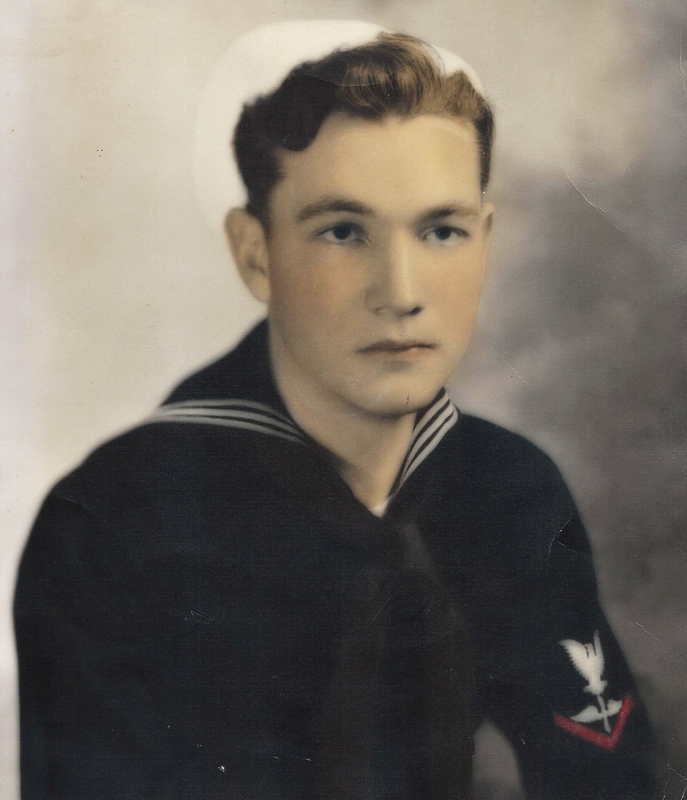 WWII – U.S. Navy 1941 through 1946: Aviation Machinist Mate 3rd Class – National WWII Memorial Honoree. In December 1941 Lawrence, known as Gene by friends and family, was in High school at the Chilocco Indian Agricultural School located on the Kansas Oklahoma border. Gene said that when word came that the Japanese had bombed Pearl Harbor, his and his classmates’ only question was, “Where the heck is Pearl Harbor”? At the time Gene was only 15 years old and would not be 16 until January 16, 1942, making him too young to enlist until July 1942. He convinced his Aunt, as having been adopted, he did not know his mother or father, to sign the enlistment papers and indicate that was 17. Gene was soon enlisted at Muskogee, OK and was sent to Boot Camp in San Diego, CA. Gene said that this “was a snap for all of our old farm boys, but some of the city boys had a hard time”. 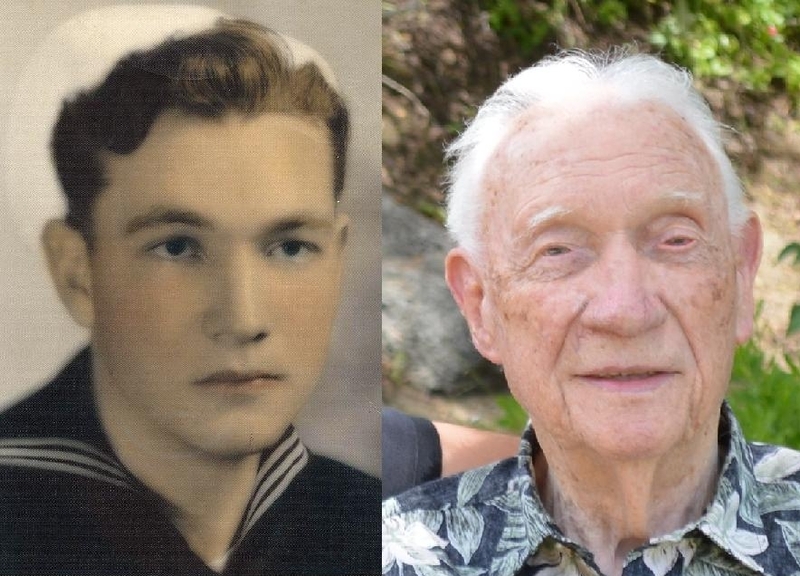 After “boots” he was assigned to the Naval Air station in San Diego where he took air gunnery training and was assigned to Carrier Air Service Unit 5 (CASU-5). His duty was to maintain and service the Grumman F4F Wildcat, F6F Hellcat, TBF Avenger, Vought F4U Corsair, Douglas SBD Dauntless and other aircraft for carriers. Over time he was assigned to CASU-69 and CASU-6. The headquarters of these units were located from San Diego to Ford Island (Pearl Harbor) Hawaii and all points in between and beyond. CASU units were never assigned to any one ship or squadron. Gene said, “they came to us wherever we were or we caught up with them. We hitched rides on different ships or flew from spot to spot”. Gene was on the move so much that his mail could only catch up with him through the Fleet Post Office (FPO) in San Francisco. He was at some point assigned to a Supply group instead of a Battle group, but he said that it is difficult to remember where one ended and the other began. In the fall of 1944 his unit flew into Ford Island, Pearl harbor. They worked there for a short time and then boarded the Cruiser U.S.S. Wilkes Barre headed for Guam. They were stationed in Guam for a few weeks working and furnishing aircraft to a couple of Carriers possibly “the old Enterprise”. In August 1945 Gene was headed for some place that he doesn’t recall due to “the ravages of time on his memory” when he received word that the Enola Gay had dropped the first “big” bomb. All activity and duty stopped and froze in place. When the second bomb was dropped it was the beginning of the end. All he and others thought was “head for home”. He was discharged in Norman, OK in July 1946 and his adventure ended. 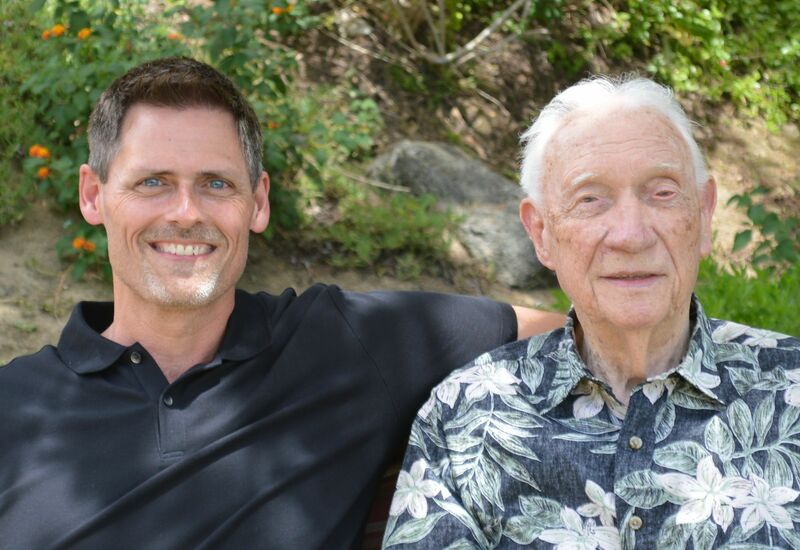 When I asked Gene if he would share some of the most memorable events of his service, he said, “I suppose all of us were in harms way at one time or the other, but to tell you the truth the most things I remember is the outstanding, dedicated men and women I met in the service”. I have known Gene since 1991 but we never really discussed his military service until 2014. 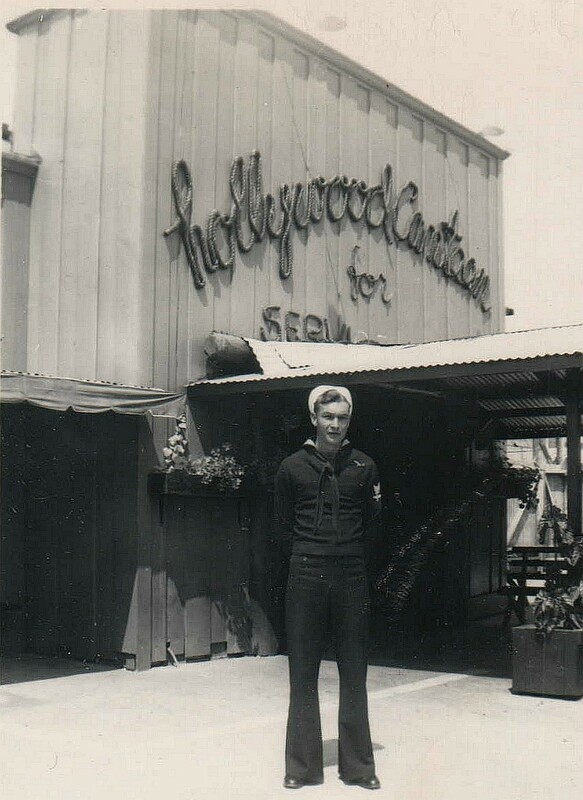 Gene at the Hollywood Canteen in 1943. The Hollywood Canteen operated at 1451 Cahuenga Boulevard in Hollywood, California, between October 3, 1942, and November 22, 1945 (Thanksgiving Day), as a club offering food, dancing and entertainment for servicemen, usually on their way overseas. Even though the majority of visitors were U.S. servicemen, the canteen was open to servicemen of allied countries as well as women in all branches of service. A serviceman’s ticket for admission was his uniform, and everything at the canteen was free of charge. 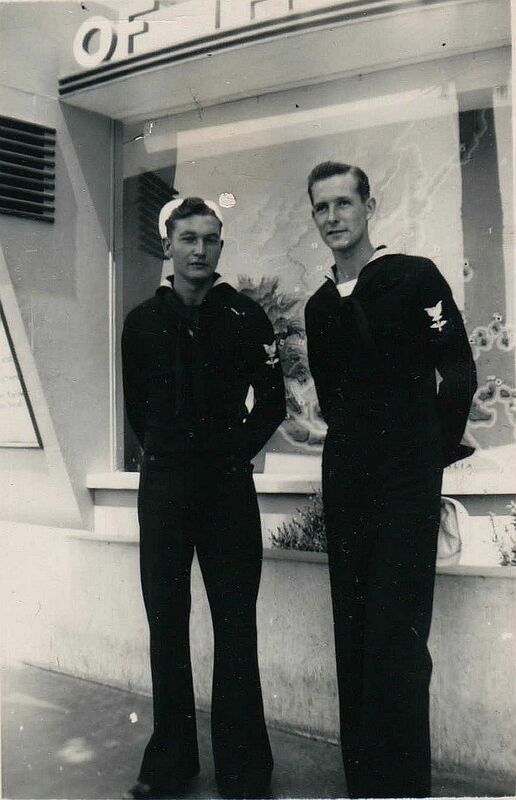 Gene with fellow crew member somewhere at the Crossroads of the World while waiting for a show at the Hollywood Canteen to start – 1943. Interior of Hollywood Canteen – audience applauds band seen on stage. People receive word of Japanese surrender, throw confetti into the air, cheer, etc. Lawrence was born on Jan 16, 1926 in Fort Gibson, Oklahoma. He passed away on October 29, 2016. Gene was a true gentleman and will be greatly missed by the whole family. Hi, although I’m not 100% about it, I think Gene and his buddy are “waiting for the Hollywood Canteen to open” down the street at “The Crossroads of the World.” It’s not far from the Hollywood Canteen and the block lettering “OF THE” looks like lettering on several Crossroads signs. Also, I saw a photograph, that I can’t locate right now, that mentions the design of the place was supposed to be like a ship coming in to port and the various shops were to be selling goods from all over the world. It was indicated there were display maps showing where the various goods came from and it occurred to me that might be what they’re standing in front of. By the way, the other photograph of Gene standing in front of the Canteen is the “only” canteen photograph I’ve seen where there is landscaping (greenery) in front of it. Love these photos. Excellent information. I really appreciate it. I’ll ask Gene about this and see what he says.